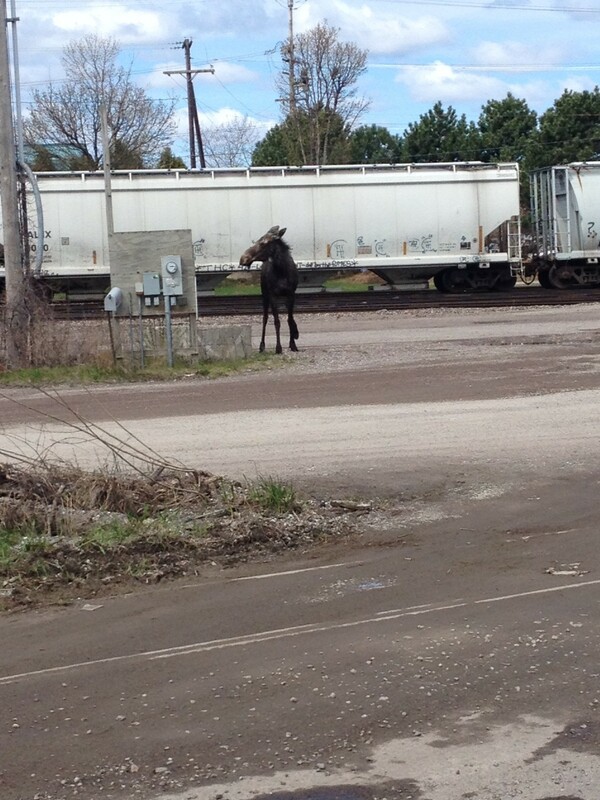 In a devastating blow for office productivity in Burlington's South End, a moose showed up today. And did stuff. That people could take pictures of. When they weren't busy scurrying away when it changed directions and headed for them. The moose, which appeared to be quite young, ambled along the bike path, walked the railroad tracks, took a brief dip in Lake Champlain, scurried up Battery Street, and took over the Twitter feeds of pretty much everyone who was close enough to take a picture, or knew someone close enough to take a picture. Like, for example, this one. Local office workers (including almost everyone at Seven Days, not that it's our production day or anything), taxi drivers, television crews, passersby — basically, everyone stopped and stared. And occasionally retreated behind something large. A police officer on the scene said that nobody at his department or Vermont Fish and Wildlife was interested in capturing the moose and plan to simply let it find its way home. Officers fanned out across the area, however, to make sure curious observers didn't get too close or do anything too stupid. The first sightings of the moose came in South Burlington this morning, police said. Local dispatchers say they have been swamped by calls, and urged people to stay the heck away.